But you moved to the UK, right? I did, yeah. I wanted to learn English. I just wanted to see the outside world. I grew up not knowing much about the outside world. I guess my generation we were growing up and suddenly find there is more than one country – outside China there is a world out there. So we certainly have this horizon open to us. So we just wanted to see… – Me, I just wanted to see what other cultures are out there and learn English. And that is a wonderful thing I think – I do not know why but I think concerning the cultures the first step to understand a culture is to understand the language. That is the key, it is a magical feeling that you are able to connect with people by languages. However little, maybe not perfect or correct, but you suddenly have smiley faces and everything else just breaks, melts away and you start to get real communication – so I wanted to learn English. And was it London or another city? I went to London first, to a language College in Milton Keynes, not far on the outskirts, and then I went to another part on the South coast of England, Bournemouth, and again it is a pretty town. So I have moved around a little bit when I was studying languages and then I went to university again in Birmingham, so I moved to Birmingham. And you still continued practicing Taijiquan? Oh, yes! Yes, that is one thing that always stayed with me no matter where I went. I just felt I needed to do something to be myself, to be me. When I was doing the language course, I was practicing still and when I was trying to learn English, improve my English, I was asked to make a presentation, to practice my English. I asked, what can I do, I don’t know much about the culture? So the teacher of the College said, why don’t you talk about something you know pretty well and comfortable? And I thought: I only know wushu – Tai Chi and martial arts. So what should I talk about, I will just talk about Tai Chi. – This is the subject I chose and I prepared really hard for it. And – mainly to practice my English – I wanted to express the feeling when you do Tai Chi, how it is a space and time for yourself and its unique feelings. I wanted to get the focus on that so I did a lot of practice and it kind of paid off. After my presentation to the class everybody said: so can you teach us? [laughs] Including the teacher everybody was like: That sounds fantastic – can you show us a little bit? They wanted to see a little demonstration, so I gave a little demonstration and then the next thing was: Can we learn it? Can we learn from you? – But in a nice sort of way. And then I started teaching my College friends in England. 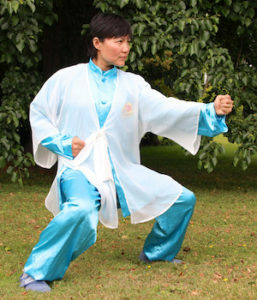 The word got round that a gym nearby was looking for a Tai Chi instructor. And I just started at one gym, another gym, another gym… [laughs]. It just started like that.